When am I going to play ? - seniorstennis Webseite! When am I going to play ? WS/MS 35-40 starting from June 8 until June 10, 2019 . Matches played all day. WS/MS 45-50 starting from June 7 until June 10, 2019 . Matches played in the afternoon until late evening on week days . 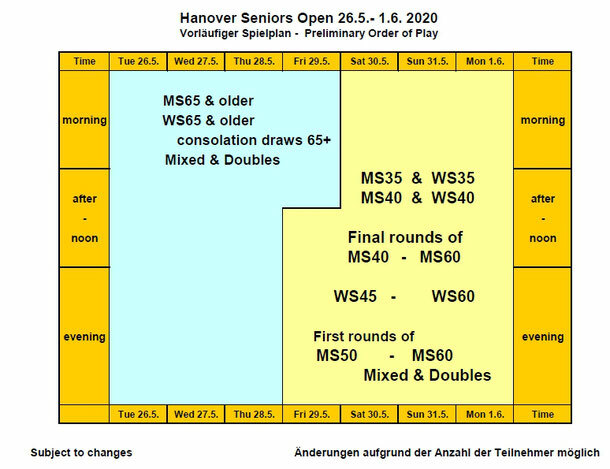 WS/MS 55-60 starting from June 6 (for draws with more than 16 players) until June 10, 2019 . Matches played in the afternoon until late evening on week days . Please note: June 4 is only required if we are overrun with entries (>200 entries). This all depends on the overall participation and draw size and is subject to change as required. If you have questions, don’t hesitate to call at +49 173 31 9090 1 or send email to mail@seniorstennis.info . Please let us know about your availability ( mail@seniorstennis.info ) . We try to consider your availability when scheduling matches as long as we know about it before the draw is made.